I see this is for sale on ebay. It's new, dated June 2018, so it may still be for sale in shops. If I find one I'll buy it and let you know what it's like. Has anyone bought this yet Rich. ..but it’s good to give it another plug as it’s a great magazine. 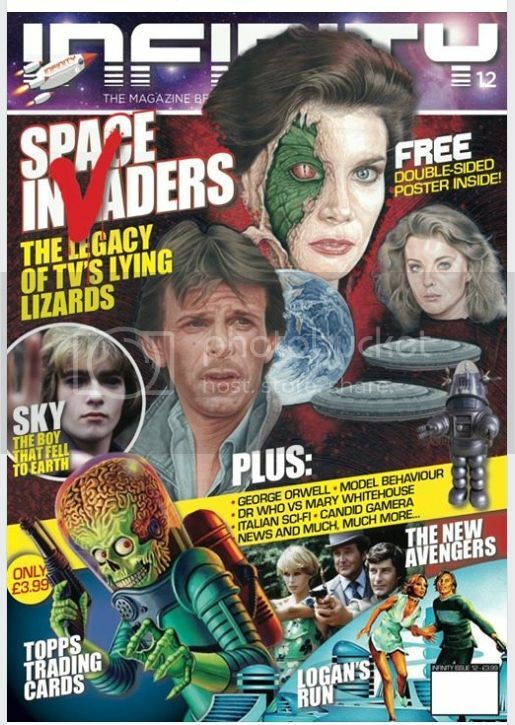 I hadn't realised Dennis had mentioned this in another thread.I've just seen that the Honor Blackman era was covered in an earlier issue (no 4).Does anyone have this? What's the content like Thanks. I bought a digital version of the latest issue through pocketmags. I haven't looked but I'd guess that back issues are available the same way. I have both issues, thought they are great. I doubt there is anything in there you don't already know but the editors are such big fans that its infectious not to enjoy the Avengers heavy issues. The poster and cover of the latest issue is worth the cover price alone and its their best selling issue so far. Issue 4 is available from their back issues online and the latest issue is in shops now. Thanks for that. I bought a copy today. It's a great mag, so I'll be looking out for this each month. I was looking for the free poster inside the mag. Is this actually the centrespread Great cover as you say, and how long has it been since we've seen The Avengers on the cover of any magazine? It looked great on the shelf in Smith's. TNA are in next month's issue. Can I ask about issue 4? Are there many pages and photos from the Cathy years inside? Thanks. Glad you enjoyed it. Yes the poster is the center spread, still good though, cracking artwork. Issue 4 has a 5 page spread on the Cathy years, I thought it was worth it, only a fiver delivered for the back issue. Looking forward to next months TNA feature, great to see The Avengers back on the magazine covers again, I think they have carved out a nice market for a different type of magazine in this digital age. Sounds good. I'll order a back issue of no 4. It's a long time since I've seen a mag this good. I used to buy loads back in the 80s and 90s such as TV Zone, Starburst and Dreamwatch, which often featured The Avengers. Infinity is the first mag I've wanted to buy for a long time. Hopefully it will stick around and feature The Avengers now and again. Rich. I feel the same, been ages since I bought a film magazine. I used to buy all of those too. Im thinking of subscribing to Infinity, will see how TNA issue looks next month. It looked great on the shelf in Smith's. I hadn't realised it was that accessible. I went into WHSmiths today and picked one up. Much nicer to have a hardcopy than the digital download, and at that price I didn't object to paying twice.